The highly-anticipated Woehrle Athletic Complex had its grand opening on April 25th. 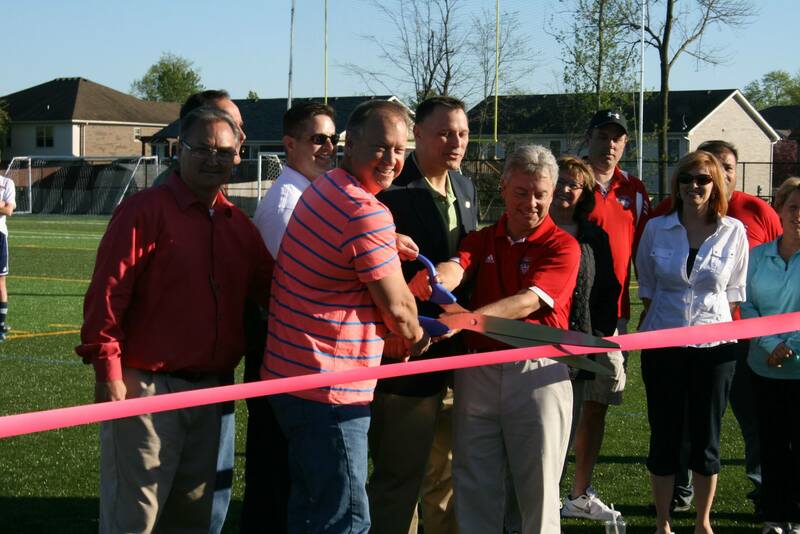 The event was the official ribbon cutting/grand opening of the Premier Synthetic Turf Field at the complex, 4200 Charlestown Pike, Jeffersonville, at the Premier Turf Field, the only one of its kind in the area. The Woehrle Athletic Complex was created by a unique partnership between the non-profit Clark County Soccer Association (CCSA) and the Jeffersonville Parks Authority. “The City of Jeffersonville is very grateful that CCSA donated the land for this project. The City of Jeffersonville was able to use park resources to maximize the soccer and football park potential of this land which is a wonderful addition to our parks system and will be enjoyed by many Jeffersonville families now and for generations to come,” said Ed Zastawny Jeffersonville Parks Authority President and Jeffersonville District 2 Councilperson. “It’s been a blessing going down to the soccer field every day and seeing the Complex come together. The partnership established between The City of Jeffersonville, The Parks Authority and CCSA will benefit everyone in Jeffersonville,” said Paul Duckworth, President, CCSA. The Woehrle Complex and Turf Field was designed by Kovert Hawkins Architects. AML’s Matt Gullo has been the on-site Architect overseeing the construction. “We’re really proud to be a part of what’s happening. I think it’s great for the community. The cooperation between the Jeffersonville Parks Authority and non-profit CCSA is an incredible coming together of different entities to achieve a common goal for the good of our entire community,” said Jamie Lake, Principal and Architect, Kovert Hawkins. The Woehrle Complex was constructed by AML Inc. “AML Inc. was excited to be a part of a project creating a complex where youth can develop their athletic talents we applaud the City of Jeffersonville for providing the resources for such a facility,” said Lincoln Tackett, Project Manager, AML Inc. 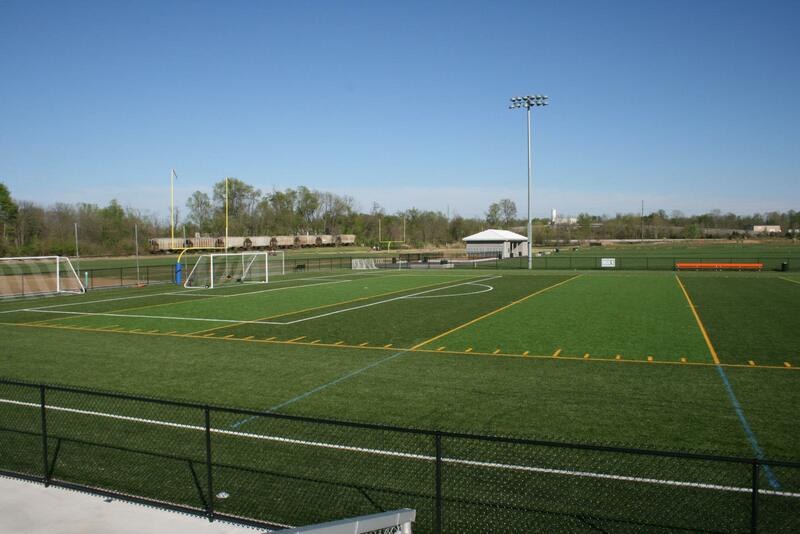 The Woehrle Athletic Complex has five grass soccer/football fields and one premier turf field and this complex plays host to CCSA recreational soccer, the Jeff Parks Youth Football League, and Southern Indiana United (SIU) select soccer. The premier turf field is now complete and includes bleachers, an elevated press box and is lighted so that it can host night games. “This all-weather turf field gives the Jeffersonville Parks Department a unique venue for teams to enjoy field sports regardless of the weather conditions and it’s for this reason that the turf field will also play host to semi-pro football and semi-pro soccer games this summer and fall,” said Paul Northam, Jeffersonville Parks Director. The cost of the grass fields and turf field was approximately $3.25 Million. This cost does not include the estimated $1 million of land donated to the city by CCSA. Jeffersonville also provided $750,000 to improve a 1/4 mile stretch of Charlestown Pike near the entrance to the Woerhle Park Complex to improve safety and traffic flow. “The Parks Authority is also planning to add a large all sports building to this property in the future to allow for wide variety of inside court sports such as volleyball & basketball as well as host regional youth tournaments and various competitions including cheer leading, table tennis and martial arts,” And we plan to have another event for the opening of the five additional grass fields in the fall after the grass is strong enough the host fall football and soccer games,” said Zastawny. The President of the Parks Authority from concept to completion has been Councilman Ed Z. Zastawny. He may be reached at 502-693-8890. The Jeffersonville Parks Authority is comprised of the members of the Jeffersonville City Council.